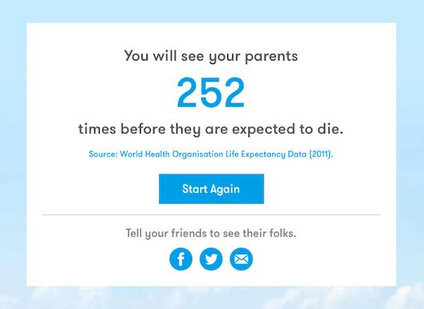 I Will See My Parents 252 Times Before They Die — How About You? 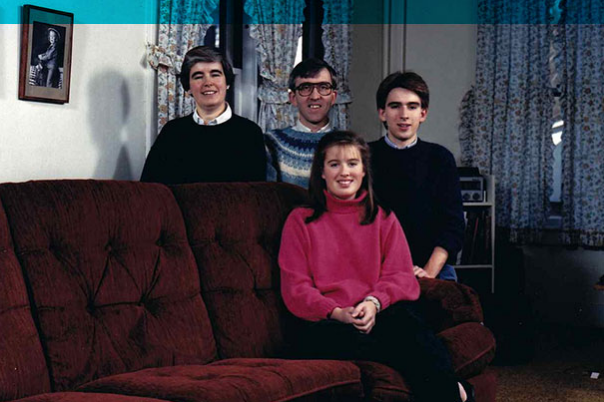 I recently came across a clever but depressing little website called See Your Folks. When you get to the site, you plug in a few simple facts, like how many times you see your parents per year and how old they are. Then See Your Folks calculates for you how many times you’re likely to see them … before they die. It turns out that my number is 252. This reality check has reminded me again how absolutely crucial it is to find ways to step outside of the moment and see any business venture for what it is: one part of a life’s work, not your entire reality. After all, for a while now the line between my professional life and personal life has been pretty blurry. Don’t get me wrong: Transforming a tiny startup into a global tech company has been a thrill. But it’s left me with a lot less time to see my parents. So, since resolution season is upon us, maybe it’s time I made one. In 2014, I resolve to find more ways to maintain a healthy and holistic perspective on life. If you find yourself checking work emails while you’re out with friends, spending less time with the family and worrying about Monday morning on Saturday afternoon, it might just be time to add that resolution your list, as well. So what does a healthy, holistic perspective look like? I don’t have all the secrets, but I think work-life balance is key. For some people that could mean slotting in more yoga, golf or short vacations. For others, it’s more quality time with family and friends. Social media can actually be a useful tool to stay connected, too. Every day, I turn to Twitter and Facebook from my office to commiserate, celebrate and bounce ideas off of friends and colleagues. Use social media and technology to your benefit—take a few minutes out of each day to reach out to people you care about. Having a healthy and holistic outlook on life is also about keeping your sights set on the bigger picture and finding a greater sense of purpose beyond the day-to-day (Believe it or not, Russell Brand seems to be doing a lot of this lately.) Earlier this year, we secured a $165 million investment, a number that I couldn’t have imagined 5 years ago. With all that capital, comes a whole new set of responsibilities. For me that could have meant prioritizing my work even more … and putting off that trip to the parents for another few months. But I also have bigger goals with my life—like supporting youth entrepreneurship and innovation through The Next Big Thing foundation. These things, I’ve found, keep me focused and grounded through career moments both high and low. 252 times … that really puts things into perspective. Time, and life, wait for no one—no matter how important your job may be. What will you do in 2014 to step outside of your every day and see your life for what it really is?